Office pests, that is the two-footed kind, continue with annoying behavior, despite how stressful and insecure making a living has become. They don't stop e-mailing those jokes they think are a riot, talk non-stop about their resolution to lose weight, complain/gossip about management, stink up the place with their desk snacks, and ask for way too many favors. The problem for you: How to manage this nuisance without being sued by the pests for defamation of character, fired for abusive behavior, developing a reputation for not being able to get along with people, or needing professional mental help? There are proven strategies and tactics to reduce their impacts on your work life. Actually, you can arrange your little cubicle universe so that they rarely even seem to appear on your emotional radar screen. One must-do, recommends relationship expert Sylvia Lafair, Ph.D., is to attempt to understand why their interactional patterns are what they are. What Lafair has found is that most "are looking for attention." Given human nature, they will pester you until you pay attention. Lafair says to do just that. A little goes a long way. Regularly let them indulge in their disruptive patterns, acknowledging their presence in a friendly manner. You will find they will hold you hostage in fewer ways for less amounts of time. 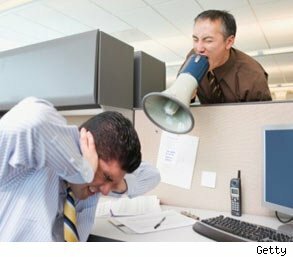 Incidentally, great workplace alliances can develop between you and the office pests since you have shown them respect. 1. Shun gossip about pests. This only gets you increasingly upset. More importantly, those most skilled in grapevine dynamics are likely to transmit whatever you said out of context and, you bet, you could be nailed for bullying, being mean spirited, defamation, or worse. Prevent becoming sucked in by protecting yourself behind a moat of verbal caution. There are standard cliches such as "She/he works so hard," "Nobody has a bigger heart," "I enjoy the break from work." Eventually the gossips will avoid including you. Rather than discourage or encourage the jokes, develop the proper performance art of responding to all those types of behavior in a low-key manner. The pest comes to your cubicle and remarks how funny "that joke about" is. Do a half smile. Slowly turn your body back to work, while mentioning how nice it would be to have lunch together. Employers are introducing yoga, meditation, and inspirational speakers to the workplace in order to help employees rise above ordinary events. Eastern thinkers such as Buddhists call that mindset "detachment." A useful book to create distance between what's going on in other people and what is important to you is 'The Four Agreements' by Don Miguel Ruiz.